1A. Aguado, J. Martinez-Mateo, and V. Martin (e-mail: vicente@fi.upm.es) are with the Center for Computational Simulation, Universidad Politecnica de Madrid, Campus Montegancedo, 28660 Boadilla del Monte, Madrid, Spain. 2V. Lopez and D. Lopez are with Telefonica GCTO, Ronda de la Comunicacion s/n 28050 Madrid, Spain. 3T. 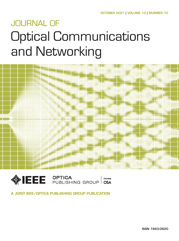 Szyrkowiec and A. Autenrieth are with ADVA Optical Networking, Munich 82152, Germany. 4M. Peev is with Huawei Technologies Duesseldorf GmbH, Riesstrasse 25, 80992 Munchen, Germany. Today’s networks are quickly evolving toward more dynamic and flexible infrastructures and architectures. This software-based evolution has seen its peak with the development of the software-defined networking (SDN) and network functions virtualization (NFV) paradigms. These new concepts allow operators to automate the setup of services, thus reducing costs in deploying and operating the required infrastructure. On the other hand, these novel paradigms expose new vulnerabilities, as critical information travels through the infrastructure from central offices, down to remote data centers and network devices. Quantum key distribution (QKD) is a state-of-the-art technology that can be seen as a source of symmetric keys in two separated domains. It is immune to any algorithmic cryptanalysis and is thus suitable for long-term security. This technology is based on the laws of physics, which forbids us from copying the quantum states exchanged between two endpoints from which a secret key can be extracted. Thus, even though it has some limitations, a correct implementation can deliver keys of the highest security. In this paper, we propose the integration of QKD systems with well-known protocols and methodologies to secure the network’s control plane in an SDN and NFV environment. Furthermore, we experimentally demonstrate a workflow where QKD keys are used together with classically generated keys to encrypt communications between cloud and SDN platforms for setting up a service via secure shell, while showcasing the applicability to other cryptographic protocols.